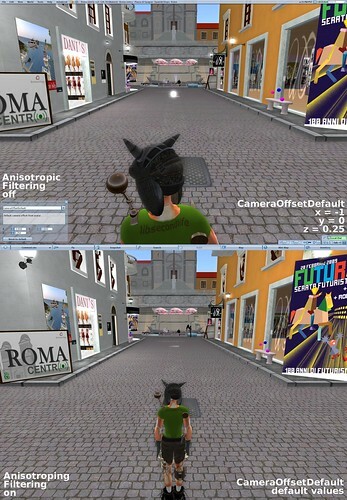 Thanks to Discord Schism for scripting up this Camera Postition script/HUD for viewing real-scale architecture! He also left the script open to modify and loaded with lots of variables to try out. If you sit down, it automatically disables the script – so your camera doesn’t end up inside the chair of the person sitting behind you, etc. When you stand up, it re-enables itself! Better still, you could easily have this set up on a client’s account ahead of a tour, so they don’t have to fumble around with inventory or settings before touring design concepts. To pick up a copy of the HUD, stop by here: http://slurl.com/secondlife/Architecture%20Island/32/99/23 fwiw, I made the sign buyable for $0 with copy/mod rights so you can make it available on your own parcel if you want to. What are you favorite settings?